On December 10th, 2008, DAMAYAN Migrant Workers Association celebrates the 60th anniversary of United Declaration of Human Rights with the domestic workers, women, im/migrants, people of color and all oppressed people whose human rights are under attack and are struggling for justice, dignity and liberation. Filipino im/migrant women workers continue to face the brunt on the deepening global economic crisis and are subjected to rampant human rights violations perpetrated by bad employers, diplomats, governments. We demand that individuals and institutions be accountable for upholding the basic rights of all people as recognized in the United Declaration of Human Rights and the need to develop additional protection for domestic workers. Like Marichu Baoanan, a Filipina nursing school graduate and caregiver who filed 15 counts of trafficking, forced labor and racketeering against former Philippine Ambassador to the United Nations Lauro Baja, women workers from around the world have first-hand experience of abuse, dehumanization and enslavement. Marichu was forced to make the painful and risky decision of migrating abroad in the interest of her family's survival. While she expected to earn a living in a forieign land, away from her family and familiarity of her homeland, she did not anticipate the slave wage equivalent to 6 cents per hour, 18-hour working conditions and being subjected to routine insults, curses and humiliation. FIGHT FOR HUMAN RIGHTS, OUST GMA! New York ---On December 10th, 2008, DAMAYAN Migrant Workers Association celebrates the 60th anniversary of United Declaration of Human Rights with the domestic workers, women, im/migrants, people of color and all oppressed people whose human rights are under attack and are struggling for justice, dignity and liberation. Filipino im/migrant women workers continue to face the brunt on the deepening global economic crisis and are subjected to rampant human rights violations perpetrated by bad employers, diplomats, governments. We demand that individuals and institutions be accountable for upholding the basic rights of all people as recognized in the United Declaration of Human Rights and the need to develop additional protection for domestic workers. Like Marichu Baoanan, a Filipina nursing school graduate and caregiver who filed 15 counts of trafficking, forced labor and racketeering against former Philippine Ambassador to the United Nations Lauro Baja, women workers from around the world have first-hand experience of abuse, dehumanization and enslavement. Marichu was forced to make the painful and risky decision of migrating abroad in the interest of her family's survival. While she expected to earn a living in a forieign land, away from her family and familiarity of her homeland, she did not anticipate the slave wage equivalent to 6 cents per hour, 18-hour working conditions and being subjected to routine insults, curses and humiliation. Since filing the civil lawsuit in the US Southern Court District of New York in July, Marichu has led the way to exposing the common experience of domestic workers who are trafficked and abused by UN representatives. 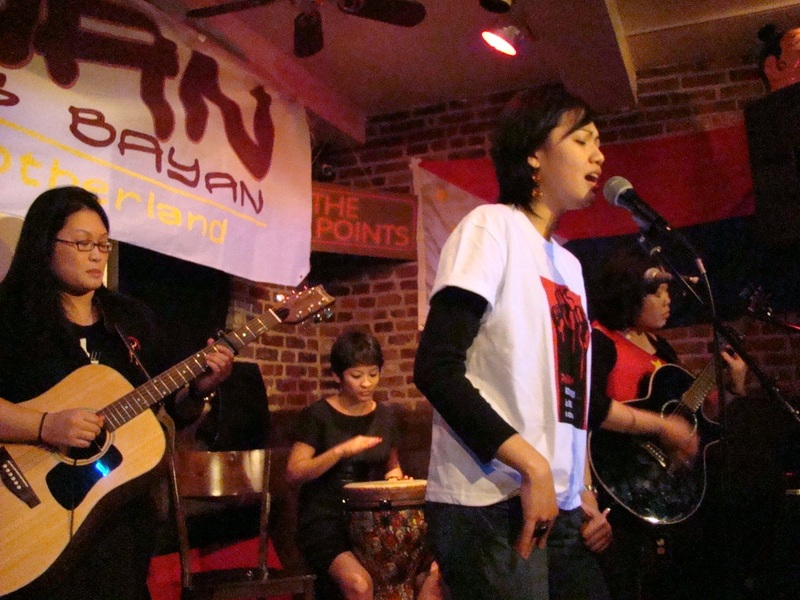 DAMAYAN launched a campaign to support Marichu's demand for justice. Marichu formally submitted a letter to the Philippine Permanent Mission to the UNited Nations requesting assistnace from the Department of Foreign Affairs, requested a meeting with top Philippine officials who were in New York City for hte October UN 63rd General Assembly and held two protest actions in front of the Philippine Consulate of New York. The campaign demanded a waiver of Baja's diplomatic immunity from the Philippine Department of Foreign Affairs and the local consulate and UN Mission so that Marichu could access justice through the legal system. Marichu's case has drawn international news and front-page headlines, as well as international outrage. More than 30 organizations from acroos North America have endorsed the campaign and are amplifying the call to waive Baja's diplomatic immunity. Despite the community's demands, Philippine public officials have done little to nothing to ensure justice for Marichu. The inaction of the Philippine Department of Foreign Affairs in not waving Baja's diplomatic immunity exposes the Philippine government's tolerance of human rights violations, and in the case of former UN Ambassador Baja, an active perpetrator of human rights violations. Marichu is a product of the economic and political crisis in the Philippines that drives more than 4,300 Filipinos to go abroad to more than 196 different countries around the world in search for a better means of survival. She is one of the 10 million Filipinos who are living and working outside of the Philippines. Marichu contributes to the $20 billion dollars in remittances that is the lifeline of the Philippine economy. She resembles the overlwhelmingly women majority of those who experience abuse and dehumanization. The DFA's lack of support of Filipino national Marichu is an example of the negligent, anti-people and corrupt policies maintianed by the Philippine governemnt and impacting overseas Filipinos wordwide. As the United Declaration of Human Rights marks its 60th year, the world faces a global economic crisis. Human rights and today's global crisis are closely related. The US-backed President Gloria Macapagal-Arroyo administration is mired multiple corruptions scandals, a record of 1,000 extradjudicial killings of peasants, workers, women, youth, activists, lawyers and church people, a state-sanctioned war in Mindanao that has caused the displacement of 500,000 people, and a ballooning foreign national debt of $60 billion. The state-exacerbated economic crisis in the Philippines drives the out-migration. In countries like the US where Filipinos migrate in hopes of a relief from the crisis, women workers are doubly hit my the local economic crsis. Im/migrant workers, mainly women, bear the economic hardship while the rich are bailed out. More than $2.5 trillion are given to corporations while millions of working people suffer from inadequate housing, education, health care and other social services. Im/migrant women workers are not only losing jobs and working more for less pay, but they are forced to stradle the crisis in the host country and their homeland. Marichu and the millions of working people like her understand the need to fight for basic human rights. As the global economic crsisi intensifies, oppressed communities will continue to be under attack and must take up the challenge of asserting the right to have a life with decency, peace and dignity. It is up to the people, especially women workers, to take up the fight against modern-day slavery, trafficking, abuse and exploitation. It is up to the people to promote human rights and human dignity, fight for just wages and living conditions, and build a more humane society. Justice for Marichu! Waive diplomatic immunity for human rights violators! End the human trafficking of Filipino women workers and all women workers! Uphold the Universal Declaration of Human Rights! Continue the struggle for justice and liberation in the Philippines and abroad!